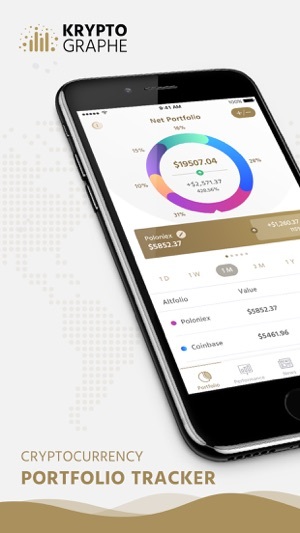 KryptoGraphe is the first Crypto Tracker App that integrates with your crypto exchange accounts and auto-syncs your portfolio, so you don't have to manually enter all your transaction details. 20+ crypto exchanges and 6 wallets are integrated with KryptoGraphe already, and more continue to join. Get a real view of your crypto portfolio, see how you’re performing and keep up with the latest coin stats and cryptocurrency market news. Get a detailed analysis and meaningful insights on how your portfolio is performing and go through history to calculate the average buy price. .
Download KryptoGraphe now to get started! - Growth or decline percentage. - Period (day, week, month, etc). 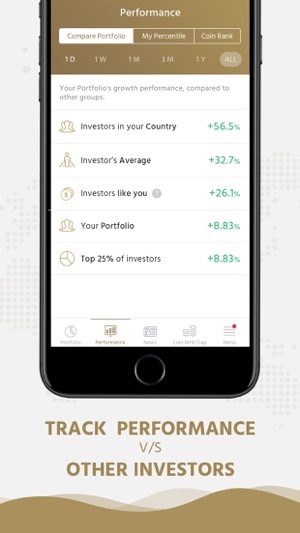 - View by Top 25% Investors, Investors from Your Country, Investors with Similar Portfolio Sizes, and more. - Create a watchlist of the coins you want to follow. - Advanced features like search option, access to complete list and set alerts available now. - And more added all the time! - Profit & Loss report - can be viewed either by Altfolios or coins and within a selected time period. KryptoGraphe is the first crypto portfolio tracker to be compliant with the European Union's General Data Protection Regulation(GDPR). It allows you to export personal data and delete it if you chose to close your account. Make managing your crypto portfolio a simple task with KryptoGraphe! Download now to get the most out of your investments. • The subscription is billed either monthly or annually at $4.99 or $49.99 for KryptoGraphe Premium and $6.99 or $69.99 for KryptoGraphe Gold. • Subscriptions may be managed by the user and auto-renewal may be turned off by accessing your account settings after purchase. The app is very easy to use. 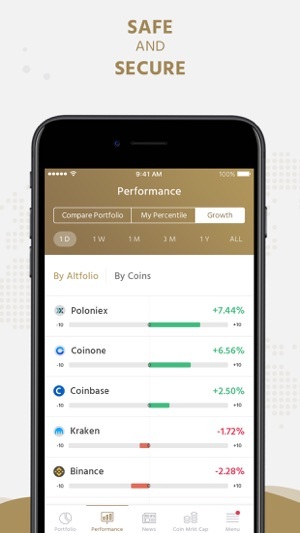 For a beginner in the cryptocurrency industry like myself this app is a must have as it does all the heavy lifting for you by constantly monitoring any changes in your portfolio and allowing you to see how you compare to fellow investors. I love the news feature and I love that it opens up in the app itself. The interface is clean and simple to navigate. Along with syncing your portfolios there is also the option to manually add your investments so you have control over what the app can access. 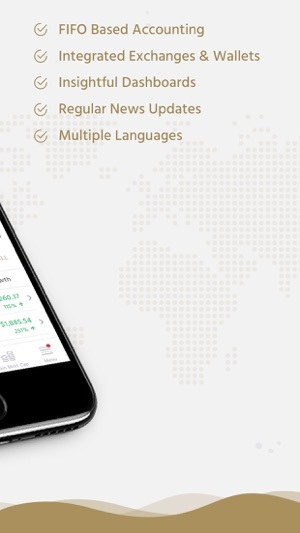 Finally changing the currency you are working in is very easy and the app immediately updates all your investments accordingly which I found very handy. 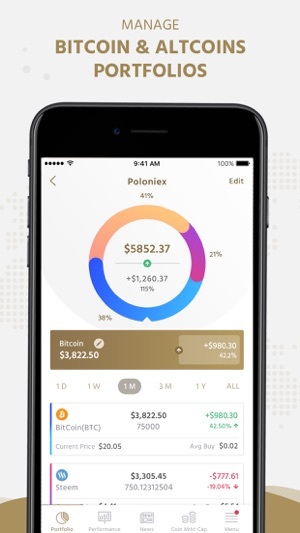 I highly recommend this app for anyone looking for real-time insights on their crypto currency investments. 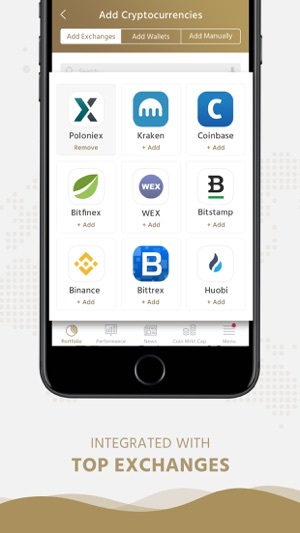 KryptoGraphe allows me to consolidate and track all my crypto investments in one app. This app is easy to use and understand. My favorite feature is the performance tab. This tab allows users to compare their performance with other investors and the market. Not only do they compare you with similar users it also compares you to investment leaders. 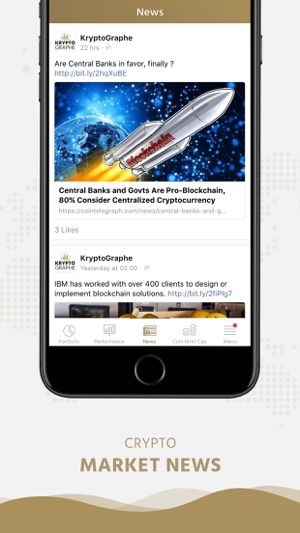 Finally, with crypto currency constantly in the headlines, this app does a great job on posting the latest news on exchanges. I never really write reviews for apps, but this app hits me amazingly so I found it only fair to do so. This app by far is truly unique in its features and it’s compatibility across apple devices. I mainly got it as a way to keep track of crypto prices from my Apple Watch because they give you the ability to add that as a widget to your watch screen, but ended up absolutely loving the iPhone app as well. It allows you to track your crypto net worth along even going so far as to now factor in trading fees. 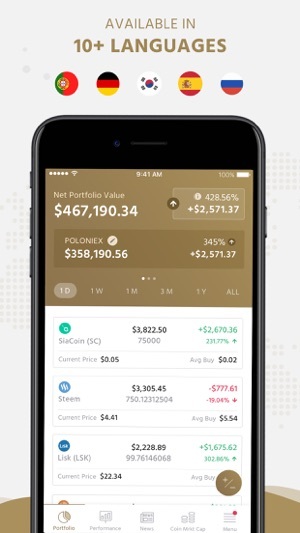 I highly recommend this app if you’re a serious crypto investor or even looking to become one. © 2017 Krypto Graphe Inc.